This tweedy textured zip-up boasts decorative raglan sleeves and anchoring ribbed borders. Inserting a zipper is not difficult when you follow our step-by-step tutorial on the last page. Sized for Man’s Small, Medium, Large, X-Large. Shown in size Medium. Note The garment length is for a modern fit garment. 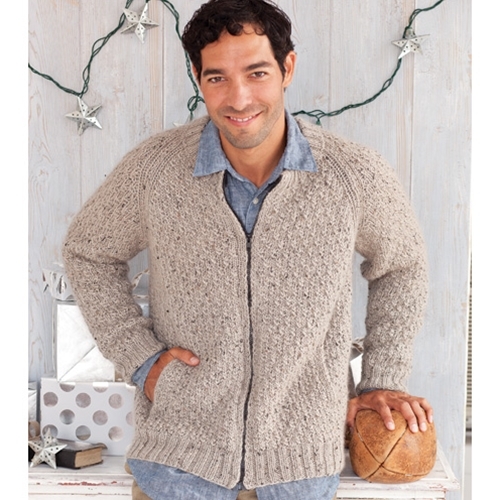 For a traditional Man’s length, add 2"/5cm before the armhole shaping and an extra ball of yarn. 20 sts and 24 rows to 4"/10cm over pebble st pat using larger needles.